Note: This is part 3 in the #HappinessHappensMonth celebration series. 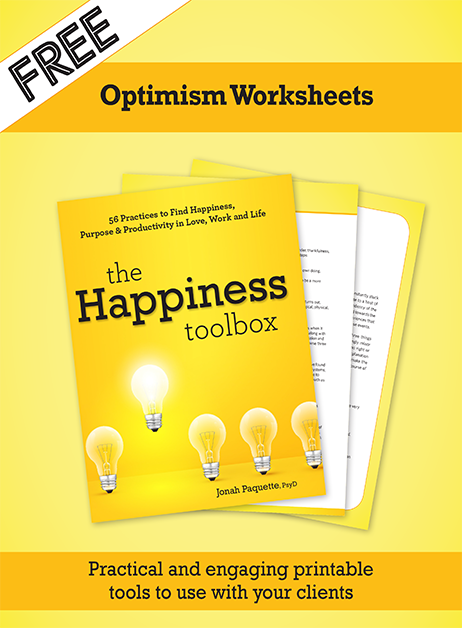 The following is an excerpt from The Happiness Toolbox by PESI expert and author Jonah Paquette, PsyD. Click here to read Part 1. Click here to read Part 2. In other words, when we reflect on our future, do we look forward to it with anticipation, expecting that things will turn out well? Or do we nervously glance ahead with worry, believing that storm clouds are approaching? Generally speaking, optimists believe that the coming days will be positive, and that they will be able to accomplish many of their hopes and dreams. Optimism does not mean that life is without challenge or pain, and in fact a key component of optimism is to be able to see things in a realistic (rather than overly pessimistic) light. We are often told to “look on the bright side” or learn to “see the glass as half full.” Although these sorts of recommendations seem trivial, they nonetheless hold great truth. In short, there have now been countless studies showing both the negative consequences associated with pessimism, as well as the numerous benefits linked to optimism. By training ourselves to become more optimistic, we can reap a wide range of benefits for our mental health and physical well-being. Whereas pessimism has been closely linked to a number of negative outcomes including depression, anxiety, and even suicide, optimism is among the most important ingredients for a life of happiness and well-being. Studies show that individuals who are more optimistic have lower rates of depression and anxiety, higher rates of life satisfaction and happiness, and are more resilient in the face of stress. It's' thought that one of the key benefits of optimism is that it short-circuits rumination, which is strongly linked to negative mood states like depression and anxiety. Not only are grateful individuals happier, research suggests that they are healthier as well. Studies have found that individuals who regularly practice gratitude have improved overall physical health, stronger immune systems, and reduced rates of stress-related illnesses. Not only that, but research has linked the practice of gratitude to other benefits such as getting better sleep (as much as an extra hour per night), and exercising more (as much as 90 minutes more per week). Grateful individuals have stronger interpersonal relationships, including more satisfying romantic relationships, across a number of studies. They also are more altruistic and likely to donate to charities and engage in volunteer work, and are even more able to let go of resentments and foster forgiveness. Cultivating optimism impacts our brain in a number of ways according to the latest research. First, optimists tend to display greater activation in their left prefrontal cortex, an area of the brain closely linked to positive emotional states. Additionally, they show decreased sensitivity in their amygdala, the small part of our brain that fires up our fight-or-flight response during times of stress. Finally, optimists display greater activation in a region of the brain known as the orbitofrontal cortex, which is associated with helping us to better regulate our emotions and decrease our anxiety. Want to help your clients discover the benefits of Optimism? 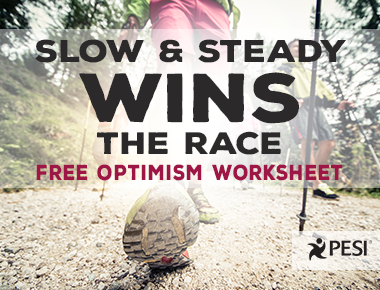 Download this FREE practical and engaging printable Slow and Steady Wins the Race Worksheet, taken from the Happiness Toolbox, to use with your clients today!